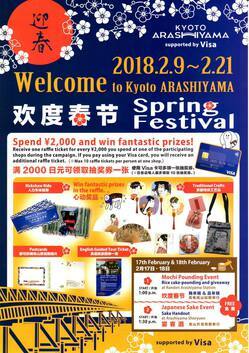 International tourists will receive one raffle ticket* for every \2,000 spent at each participating store** in the Arashiyama area. 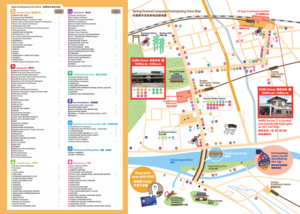 These raffle tickets can be used at one of the two raffle venues to win prizes including traditional crafts, rickshaw tours, and even tickets for the English Guided Tour at Nijo-jo Castle. On Saturday, February 17th and Sunday, February 18th, at 1:00 p.m., the Omotenashi Vision Promotion Council and other organizations will be hosting a mochi rice cake pounding event at Randen Arashiyama Station’s Hannari Hokkori Square. At 1:30 p.m., free samples of Japanese sake will be distributed at Arashiyama Shoryuen.